To enjoy your trip with complete peace of mind, Yescapa provides a a rental contract that protects both the renter and owner. Before you're on the road, you must make sure that you have the signed rental agreement in your possession. It allows you to secure the rental with all the necessary information and is necessary to handle any incidents that may occur during the rental (the information provided on your profile is automatically pre-filled on the rental contract and insurance confirmation document). This rental contract will be available on your profile once the booking has been confirmed and the required documents have been validated by the Yescapa team. It will be available at any time via your dashboard, on the tab reserved for managing your rentals. All you have to do is print it out and bring it along to sign when you are picking up the keys. In accordance with the article 1713 and the Civil Code, it has been agreed that the vehicle owner rents the following vehicle to the renter on a non-professional basis, subject to the price, charges and conditions mentioned above. The vehicle currently being rented is intended exclusively for private and personal use, as a vehicle for leisure and tourism. Yescapa cannot be held responsible for abusive usage of the vehicle, nor for the consequences resulting from this. The driver(s) of the vehicle currently being hired, certify that they are in possession of the licence required to drive the hired vehicle, valid, according to its characteristics and GVW (Gross Vehicle Weight). The drivers have to respect the insurance conditions for the vehicle they are renting. The insurer is listed on each vehicle listing and the conditions are indicated on the page Motorhome and campervan hire Insurance . The vehicle can only be driven by the driver(s) identified on the rental contract. The renter commits with their signature of the rental contract to engage their personal and contractual liability. Unless the damage results from the liability of an identified third party, they may therefore be held liable for any damage caused to any third party, to the vehicle of which they had the use of, direction and control and to its accessories. The renter may not assign, sublet or lend the hired vehicle to anyone for any reason whatsoever. However, should the vehicle require repairs, the employees of a mechanical garage are authorised to handle the vehicle, provided that the owner has been notified in advance and has given their written consent. The renter determines their kilometer package when sending their rental request to the owner. This kilometer package is specified during the summary of the request, before payment and appears on the rental contract. The parties accept it contractually at the signing of the contract and cannot contest it later. The owner is entitled to claim compensation if the kilometer package stipulated in the contract has been exceeded, according to the unit rate stipulated in the advertisement and reflected on the contract. Any agreement between the owner and the renter agreeing to a different kilometer rate must be indicated in writing on the rental contract. If the kilometer package authorized on the contract has been exceeded, the renter firmly undertakes to pay the difference at the rate stipulated on the rental contract. The sum must be paid, when possible, during the inventory form when the vehicle is returned. no internal and/or external damage is noted and reported on the inventory return form. Otherwise, the renter remains liable to the owner and must respect the clauses of the contract, until a solution is brought forward for the incident or the problem(s) declared. If a fine is received for an infringement during the rental period, the renter is obliged to pay it as soon as the fine is presented. If the renter damages the interior and/or exterior of the vehicle, their responsibility remains engaged and requires them to pay the amount for the repairs or the amount of the excess applied. The vehicle and any accessories made available to the renter must be returned in the condition found when the vehicle is handed over to begin the hire. The loss or the deterioration, even partial, of the vehicle or the accessories obliges the renter to pay the total amount for the repairs, under presentation of a quotation or an invoice (according to the type of repair). Responsibility is engaged via the rental contract for the hire and/or any other relevant element (report, eyewitness, third party). If the deposit is managed by Yescapa as part of the rental, the renter gives authorization to Yescapa to collect the amount of the sums due, according to the terms detailed in article 11. The return of the hired vehicle must take place in a very well lit place in order to complete the return inventory form in good conditions. 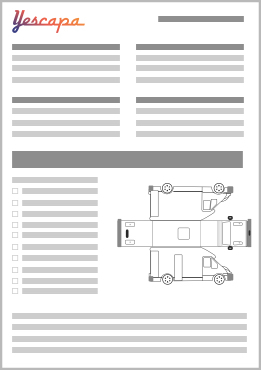 This inventory form must be carried out by the same person who handed over the vehicle to the renter and completed the departure inventory form. All parts and surfaces of the vehicle shall be examined, including the upper parts of the vehicle. The owner undertakes to respect the time agreed upon by both parties for the departure of the vehicle, or if failing this, as specified on the contract and the booking. By default, the vehicle pick-up time is set at 9 am for a morning pick up, on the day of departure and at 2pm for a hire in the afternoon. As for the drop off time, it is fixed, by default, at 12pm for a rental ending in the morning and at 8pm for a rental ending in the evening. These times are given as an indication and apply, unless different times are otherwise agreed between the two parties. These can be flexible by up to 2 hours (give or take). Unless otherwise agreed in writing by the owner, any delay in the return of the vehicle, by the renter, of over two (2) hours is billed according to the following rules: between 2 to 6 hours of lateness, the owner is entitled to ask the renter for a payment of 10 pounds per hour of delay. Beyond 6 hours, the owner is entitled to ask the renter for the price of an additional day of rental, corresponding to the daily proportional amount calculated on the total remuneration of the owner, plus one hundred percent (100%), two rental days in total. The total amount of the hire is paid in advance via the Yescapa platform and the owner's fee is paid after the end of the first day of the hire. For all the possible extra options to be paid for, the owner will have to inform the renter beforehand and come to an agreement on the amount which will have to be paid in person before the departure. The owner must, whenever possible, provide the vehicle with a completely full tank of fuel. Similarly, the renter must return the vehicle with the tank one hundred percent full (100%). Failing this, the renter must return the vehicle with the tank at the same fuel level as when the vehicle was handed over. In the event of a mechanical incident occurring during the rental period of the vehicle, the renter must notify the owner. It is their responsibility to bring the vehicle to a competent garage. Following a diagnostic at the garage, repairs or part changes may be necessary for the vehicle to be operational again. A written agreement in the form of an electronic message sent by e-mail or by text message ("SMS") from the owner must be obtained by the renter before authorizing the garage to begin work on their vehicle. In the case where the owner gives their agreement to carry out the repairs, the renter will be then be able to authorize the garage to carry out the repairs. The invoice can then be paid by the renter and the owner will refund the renter with a bank transfer, made within 48h. In the event of an incident or mechanical breakdown that immobilizes the vehicle, the renter may leave the vehicle in the mechanical garage designated by the insurance company. If there is a problem determining a responsible party, the renter must wait for the breakdown assistance, in order to complete an inventory form of the vehicle with them. They must also take all the necessary photos (inside and outside) to prove the condition of the vehicle before its removal. In the event that the vehicle cannot continue the rental, the renter must pay for the difference in fuel compared what was listed on the inventory from filled out before departure. If the owner refuses the repair or if the mechanical breakdown immobilizes the vehicle within a period longer than that provided for by the applicable assistance, it will then be up to the owner to recover their vehicle from the garage having carried out the necessary repairs. Depending on the insurer, the cost of transport from their home to the relevant garage may be covered, according to the conditions defined in the applicable assistance contract. If the immobilization is due to a misuse or an accident caused by the renter, the owner will be able to claim the expenses to bring the vehicle back home (way back only), from the security deposit given by the renter. If the cause of the immobilisation undefinable, the return costs will be borne equally by the owner, i.e. 50% for each party of the contract. The security deposit provided as part of the rental may be used to implement such a measure. If the immobilization of the vehicle results from normal wear and tear or from negligence related to regular maintenance, which is the owner's responsibility, the owner must cover the entire return journey as part of the recovery of their vehicle. Concerning the distance of repatriation of the vehicle, all the countries to visit must be mentioned on the rental contract or be the subject of a written agreement with the owner. Otherwise, the renter must refund the owner the full amount of the return trip. In the event that the mechanical incident is caused by misuse of the renter, a third party or a fixed object and the renter is found responsible, the latter will then be required to pay for all repairs incurred. If the mechanical incident is due to normal and regular mechanical wear or poor maintenance of the vehicle, the owner will be held responsible and must assume the cost of the repairs. If the renter had to pay this amount, the owner must reimburse it upon presentation of the corresponding invoices. The renter undertakes that such repairs shall be carried out exclusively by a competent garage authorised to carry out the repairs. The renter can be released from their responsibility by providing proof that the mechanical incident(s) occurred during normal use, from regular wear and tear of the mechanics or from bad maintenance of the vehicle by the owner. The culpable party can be determined with a diagnostic report of the vehicle from a competent garagiste. If it is not possible to determine a culpable party, both the owner and the renter will be held responsible for the cost of the repairs, at a 50/50 ratio. The owner undertakes to provide a vehicle in perfect working order, driving and cleanliness (inside and outside), with a full tank of fuel, having cleaned the toilet cassette, and emptied the dirty water. The handover of the vehicle implies, except explicitly written on the rental contract, that the renter validates the perfect state of the vehicle, driving and cleanliness included. Both parties to the contract are required to print the rental contract in their language of use via their Yescapa account in order to sign it and carry out the inventory of fixtures on the day of departure and return. Both parties may write in their own language on their copy: the information described must correspond on each of them. The owner undertakes to check all the important elements of their vehicle such as air conditioning, heating, water heater, fridge, oven, cooking plates (non-exhaustive list) during the inventory of fixtures as well as when the vehicle is returned in the presence of the renter. They must specifically note on the rental contract the expiry date of the gas pipes if the vehicle is equipped with them. The owner undertakes to drive their vehicle and perform some manoeuvres in the presence of the renter in order to detect any possible anomaly (suspicious noise, malfunctioning...), on the day of departure and upon return of the vehicle. The owner undertakes to rent their vehicle in the best possible state of cleanliness. In the event that the renter does not agree with the state of cleanliness of the vehicle, it is then necessary to indicate this on the departure inventory sheet, in the box intended to this purpose. It is then recommended that the owner takes the time to readjust the condition of their vehicle. If, following this cleaning or proposal of it, the tenant still refuses the vehicle put at disposal, the cleanliness of the vehicle can not be used as a valid reason to cancel the hire and no refund will be possible towards the renter: the owner will receive their remuneration as initially planned. If the owner does not wish to clean their vehicle and the renter refuses to take it, it is up to the renter to provide proof of non-conformity of the state of cleanliness (photographs, videos...): these must be sent to Yescapa as soon as possible by e-mail. The renter must immediately cancel the rental via their Yescapa account before the last hour of the first rental day (theoretical departure day). If Yescapa considers that the vehicle was not in an optimal state of cleanliness, the platform reserves the right to ask the owner for a full refund. The owner undertakes the responsibility for any repairs to the vehicle not resulting from a misuse by the renter (normal use and driving of the vehicle). In case the renter must pay for the repairs upfront, the owner undertakes to reimburse them upon presentation of supporting invoices, for which the owner will have previously and expressively given their authorization to the renter, in order to proceed with the repairs strictly necessary and strictly required at the time. Such requests and authorisations must be made in writing in the form of an electronic message sent via e-mail or via a text message ("SMS"). Unless agreed between owner and renter, the owner has no right to withdraw any amount from the security deposit provided by the renter unless the damage is indicated on the return inventory form. All evidence necessary to identify the damage and the corresponding estimate(s) must be sent to the Yescapa platform as soon as possible. In the event that the vehicle is damaged before the rental, the owner is obliged to inform the next renter in order to agree on a potential discount or arrangement. The owner must check the condition of each tyre of the vehicle rented on the Yescapa platform. These tyres must not be more than six years old. Yescapa requires that the owners take pictures of each tyre of the vehicle for the first rental of the year. In the event of a tire blow-out - older than 6 (six) years and occurring due to a detachment of the tread during the hire - the owner shall assume full responsibility for the blowout. As a result, the tenant may not be required to pay the excess. In other cases, the amount of the excess (if any) will be borne by the renter if their liability is incurred. In all cases, the renter must keep the damaged tyre so that a diagnostic can be done. If a tyre blow-out occurs on a tyre less than 6 (six) years old and without detachment of the tread, and the front or rear axle unit is to be changed, the total cost of the tyre blow-out shall be borne entirely by the renter and the total cost of the second tyre of the axle unit concerned shall be borne 50/50 both by the renter and the owner. The renter must print the rental contract in their language of use via their Yescapa account so that both parties have the same inventory. Both parties must write in their respective language. They can request help from Yescapa if there is any language issues during our opening hours. The renter has the right to refuse the rental if the main characteristics of the vehicle do not comply with the description of the advertisement proposed on the Yescapa platform. The vehicle must match the interior/exterior photographs on the Yescapa website. In case of a dispute, the renter must provide proof of non-compliance of the vehicle (photographs, videos ...). The renter must ensure the proper operation of the vehicle and all its equipment during the state of places of departure. By taking possession of the vehicle, the renter starts the rental and can not claim a reimbursement or commercial gesture from Yescapa concerning the condition of the vehicle. The renter must ensure that the vehicle is locked when they depart. They must not leave valuables in full view and must take all necessary measures to prevent theft of equipment in the vehicle. Neither the owner nor Yescapa can be held responsible for any theft, loss or damage of the property belonging to the renter and the passengers. In the event of an attempted break-in or theft, and without any identified or identifiable third party, all damage resulting from the break-in or theft will be the responsibility of the renter. In the event of an accident and / or damage to the vehicle (inside and / or outside), the renter agrees to notify the owner and the company Yescapa immediately and without delay by phone call and / or e-mail. The renter must inform the owner and the company Yescapa by sms and / or e-mail of any maintenance or repair work carried out on the vehicle during the rental. Any repairs must be reimbursed by the owner on the return of the vehicle on presentation of a supporting invoice and following normal use of the vehicle. The owner must have expressly agreed to the repairs proposed by the renter in advance. The driver(s) designated by this rental contract must hold a category B driving licence for driving a vehicle with a gross vehicle weight less than or equal to 3.5 tonnes. They must imperatively respect the minimum age and number of years they have had their licence for, required by the insurance applicable to the rental or, failing that, required by the owner in their advertisement. The renter undertakes to maintain the vehicle in a prudent and diligent manner and with the same precautions as if it were their own vehicle, to carry out all the checks made obligatory by the present circumstances. The renter is required to perform regular maintenance of the vehicle during the entire period of the contract and as long as they are in possession of the vehicle. The renter shall bear all the costs of repairing the vehicle made necessary, or insurance excess applicable, as a result of damage resulting from their personal use or from third parties to the rental contract or from any damage caused by an unidentified third party. If the vehicle requires to be cleaned by a professional, this will be paid for by the renter, upon reception of an invoice. This cannot be added to the penalties listed above. The different amounts due to the owner, will have to be paid upon the return of the vehicle, as a part of the vehicle's maintenance costs that the owner may have to incur personally. In case of immobilization of the vehicle obliging the renter to put an end to the hire, if the immobilization is due to misuse or an accident caused by the renter, the owner will be able to take the amount set by the present terms for the cleaning, directly from the security deposit. If the cause for the immobilization is unintended or undefined, the renter who must generally, hand the vehcile back in the same condition it went out in, the cleaning fee will be covered by both parties (50% each). The security deposit provided as part of the hire may be used to implement such a measure. If the immobilisation of the vehicle results from normal wear and tear or negligence related to irregular maintenance, which is the owner's responsibility, the latter may not claim compensation for cleaning of the interior or the exterior, nor retain any amount whatsoever, as the renter was not able to perform cleaning in optimal conditions following an immobilisation. Scrape, scuffmarks All types of surfaces such as doors, walls, cupboards, floor, etc. Impact, chip Delicate surfaces such as the sink, sink cover, washbasin, shower, lights, table, etc. Small impact Walls, doors, cupboards, handles/ doorknobs or drawer handles, etc. Burns (not widespread, cigarette burn type, kettle, coffee machine) Table, counter top, upholstery (cushions, seats, mattresses), floors, etc. Perforation Floors (lino), upholstery (cushions, seats, mattresses) and other types of surfaces. if the part costs less than GBP 50: the renter must replace the part or pay the owner the cost of the part itself to be replaced. If the value of the item is more than 50 GBP: the owner may define an amount for compensation, up to a maximum of 150 GBP depending on the size of the damage and in relation to the item's size and value. Cosmetic damage cannot lead to the replacement of the item with a value of more than 50 GBP unless the damage prevents the use of the damaged item. If the hidden damage is only observed due to cosmetic damage, and that the latter prevents the correct use of the part damaged, the renter will then be held responsible and must cover the costs for repairs. The renter can not make any modifications or irreversible adjustments, both inside and out on the vehicle, without the prior and express agreement of the owner. The renter must check the levels of the various fluids of the vehicle: engine oil, water, sewage, steering fluid, windshield washer and engine coolant. As soon as necessary, the renter must keep these levels adequately refilled during the rental. The renter must regularly check the tire pressure of the vehicle. As soon as it is necessary, the renter must inflate the tires to the pressure levels indicated on the vehicle's operation and maintenance manual supplied by the manufacturer. This document must be given to the renter when they take possession of the vehicle. The renter must replace any vehicle equipment that has been used or damaged during the rental period including wipers, toilet paper or light bulbs. The renter is liable for all damage caused by their own negligence or that of third parties during the rental period of the vehicle. The renter is solely responsible for any damage resulting from filling the tank with unsuitable fuel, accidentally filling the fuel tank with water, or filling the water tank with fuel. For all roadside offences detected by the police during the rental period, the renter is legally liable. The renter is fully responsible for penalties (ticket, point penalties...) reported during the effective period of the rental contract with the rented vehicle. Yescapa reserves the right to forward the documents (identity document and driving licence) to the competent authorities for attribution of the ticket to the holder of the rental contract responsible for the infringement, following the presentation of the proof of conviction received by the owner. For any deterioration inside or outside the rented vehicle, a second quote can be requested to the owners in order to make a comparison if the platform Yescapa deems necessary or at the request of the owner. This rental is expressly agreed and accepted in accordance with the applicable laws and regulations. The parties undertake to complete a thorough inventory check of the vehicle when it is rented and when it is returned. These two documents are signed by both parties. The burden of proof lies with the party who disputes the accuracy of the inventory form. The renter picks up the the vehicle in the state the vehicle is handed over in. In the absence of the inventory form (the owner and renters copy) of the vehicle on the day of the taking in hiring, the renter is deemed to have received the said vehicle in good working order, clean without other formalities. As soon as the renter takes possession of the vehicle, he is responsible for its use, control and protection. Upon return of the vehicle, the owner is deemed to receive the vehicle in good condition and clean without further formality. In case of damage (s) reported during the inventory of fixtures (return form) whose accuracy the renter would contest, it is up to them to bring the necessary evidence of their non responsibility of the damage (s). Otherwise, they will remain responsible. The renter is in full possession of the vehicle and uses it with due diligeance and under normal and general conditions of use. Particularly, the renter undertakes to take all necessary precautions and to comply strictly with the provisions of the Highway Code or the regulations in force. The insurance and break down cover correspond to those specified at the time of the booking request, contracted with payment of the booking and which are indicated on the rental contract. Damage: In the event of damage such as an accident, theft, loss, fire, damage caused by game or any other damage, the renter must immediately notify the police. In such situations, the renter undertakes to draw up or have drawn up a report attesting of the conditions under which the said damage occurred. In the event of such damage, the renter is obliged to inform the owner and Yescapa in writing as soon as possible, by sending a message via e-mail. If an amicable report is drawn up by the renter, it must be filled in at the scene of the accident, with the other driver involved in the accident, in accordance with the customs and regulations in force without any heading being evaded or ignored, or even partially, incorrectly or in a way that is difficult to read. Sketches must be drawn with care. If the accident involves several vehicles, therenter must establish a report with the driver of the vehicle in front of him, and a report with the vehicle following him. If the other driver refuses to fill in or sign the said report, at least, the registration number of the opposing vehicle must be recorded by the renter. The tenant must then try to obtain the statement of the persons having witnessed the accident, or request the intervention of a police officer. The said duly completed initial statement must be transmitted to the insurance company at the latest within five working days after it has been previously presented and validated by the owner bound to respect the above deadline which is of public order (art. L. 113-2 of the Insurance Code). The security deposit can be used to cover vehicle repair costs in the event of a claim or damage. It can also be used to cover the insurance excess. The security deposit is also intended to cover kilometers overruns and any amount owed to the owner by the renter as a result of the hire, in accordance with the terms of the rental contract. The management of the deposit is subject to the signature by both parties (renter and owner) of the rental contract and the on departure and return of the rental. The owner receives the security deposit in person, the amount of which must be indicated on the rental contract. The security deposit can be given in the form of a cheque, in cash or any other means of payment previously agreed between the renter and the owner. If the deposit is not handed over on the day of departure, the owner is entitled to refuse the hire and therefore to cancel the present hire. The renter will not be entitled to a refund. If the vehicle shows no signs of damage, the owner must give the deposit back to the renter upon safe return of the vehicle. If the vehicle shows signs of damage, the owner is entitled to keep the deposit until a quote for the damage has been issued. In the case where the rented vehicle leaves directly for a new hire on the same day, the owner must return the security deposit to the previous renter at the time of the inventory of fixtures return. The renter expressly authorizes Yescapa to recover amounts due up to €2000. If the vehicle is returned with abnormalities, the owner has 72 hours after the return of the vehicle to inform Yescapa. These abnormalities reported must be the same as those listed on the two respective copies of the inventory of return, duly completed and signed by both parties. The owner is entitled to ask the renter compensation (in cash) at the time of the return of the vehicle, if the cost of compensation is less than €100. The vehicle may only be used for the duration of the hire in the countries indicated in the booking request. The use of the vehicle is authorized only under the restrictions indicated by the owner on their advertisement (examples: limitation of travel to EEC countries only, pets not allowed, non-smoking vehicle, etc.) In the event that the renter does not respect the restrictions indicated by the owner on their advertisement, the renter is liable to a financial penalty of fifty (50) pounds: the security deposit given by the renter of the vehicle may be used for this purpose. In case of a conflict between both parties, an amicable solution is possible. Contact our mediation service to help you with your case on +44 (0)20 3695 3852. The intervention of our mediation team will be billed at fifty pounds (£50) to the party at who is deemed to be at fault after the investigation. In the case where fault cannot be determined the mediation fee will be divided between the two parties. If this fails, resorting to a competent court remains possible. The parties to the contract can go to a local judge, competent for disputes under £4000.